> HIV/AIDS threatens rural development. What can be done? HIV/AIDS threatens rural development. What can be done? In southern Africa, as well as South East Asia, HIV/AIDS has been spreading rapidly in recent years. The epidemic is increasingly moving from the cities to rural areas, where the impact will become apparent only in the coming years. However, it is clear now that there will be an acute danger of the disease destroying any previous progress in poverty reduction. According to a paper of the Overseas Development Institute (ODI), the impact of HIV/AIDS on agricultural production is only gradually becoming apparent. In periods of intense labour the disease can cause a lack of experienced agricultural workforce, as the sick can no longer work and, in addition, need to be looked after by healthy people. Additional expenses for the care of the sick, combined with less income due to the lack of working hours, strain household budgets. As a result, some households are forced to sell their means of agricultural production. When a household head dies, the family often not only loses valuable agricultural knowledge; in many cases, widows also lose land and possessions to the family of the deceased. In addition, the epidemic can have impacts on a wider regional scale, causing discontinuation of governmental services such as agricultural extension, as well as ruptures in the agricultural supply chain due to the decease of key persons. These problems are not new. They arise as a result of other catastrophes as well. However, the enormous dimensions of the HIV/AIDS epidemic make the vulnerability of the poor to additional strains particularly visible. As a reaction to the threat, the authors generally recommend that previous and current efforts towards rural development be intensified. In addition, they mention specific entry points: Shared financing and insurance systems should be improved, and, where needed, cash transfers made in order to prevent families from having to sell their means of agricultural production. Land and ownership rights of women and orphans should be strengthened. The use of labour-saving technologies in both agricultural production and housework can help to cushion the impact of loss of working hours. Efforts in education, promotion of farmers’ associations and the dissemination of market information can strengthen agricultural supply chains and reduce their dependency on individual persons. Finally, there is a need for large-scale investment in education in order to compensate for lost agricultural knowledge. FAO and the World Food Programme are tackling this last issue in a joint initiative: they have built agricultural schools for orphans in Mozambique. In these so-called ”Junior Farmer Field and Life Schools”, children learn the basic skills needed to produce food and generate agricultural income. 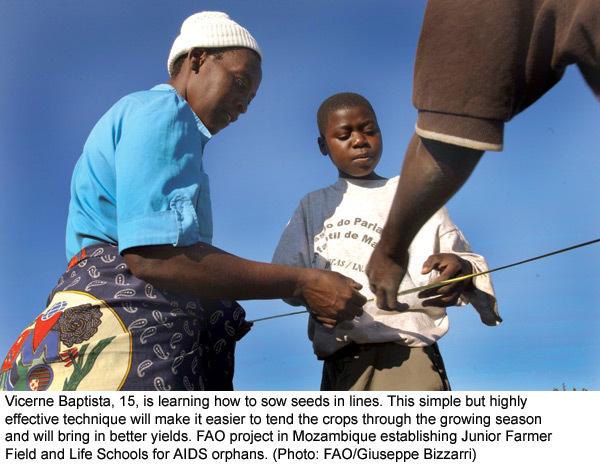 These agricultural subject matters are combined with ”survival assistance”, where the children are taught life skills such as self-awareness and self-confidence, human rights, and AIDS prevention. The project has been highly successful in Mozambique and will now be expanded to Kenya, Namibia, Zimbabwe, and Swaziland. The impact of diseases and epidemics on agricultural production have never been studied in detail, and possible solutions are only beginning to be discussed. A symposium entitled ”Poor health, food insecurity, and poverty – How to break a vicious circle?” will be held on 13 October 2005 in Berne, Switzerland. This event is intended to strengthen networking between the health and agriculture sectors, and to contribute to finding useful strategies for the rural populations in areas affected by diseases. > Responding to HIV/AIDS in agriculture and related activities. Rachel Slater and Steve Wiggins. ODI, Natural Resource Perspectives. livelihood knowledge. FAO News Story. Rome, 1 December 2004. Talking about water or biodiversity means talking politics. Both are interlinked with trade, agricultural, social, and, above all, human rights policies. Friends of the Earth International has published a report on the impacts of the privatisation of natural goods, a phenomenon that is increasingly favoured by policy-makers. Nature for sale is a document of global significance, describing more than 35 examples from around the world. In doing so, the report illustrates the experience that the poor make with profit-oriented transnational companies. As water will become tomorrow’s gold, companies have taken interest in the water of the ”Cuenca del Plata”, one of the Earth’s most significant catchments, holding more than 30 percent of the global freshwater reserve. New laws allow private entrepreneurs to penetrate into the water sector, previously publicly administered. The region’s governments additionally foster this development with their project of transforming 1940 kilometres of the Paraguay-Parana river system into a gigantic industrial waterway. In other regions of the world, nature parks are ”disneyfied”, and the wealthy industrial countries have built up a lucrative trade with carbon sequestration quota. This report makes very clear that the monetarisation of nature has lifethreatening consequences for the world’s 1.2 billion poor. Food production is no longer continually increasing. In certain important food producing countries irrigated agricultural land is actually diminishing. Fishery production, after a long period of growth, is now on the decrease. Newest research results show that a global temperature rise by 1°C could reduce cereal production by up to 10%. Water tables are falling at alarming rates. China’s cereal production has been decreasing since 2000, drastically reducing national reserves. If this trend continues, China’s dependency on imports will grow, leading to a global rise of commodity prices. This can give rise to increased unrest and conflicts particularly in developing countries. These developments pose a challenge to policy-makers not only in the agriculture sector, but also in the energy, economy, and education sectors. Future food security depends on whether we will succeed in stabilising the 4 agricultural key resources: cereal cropland, water, pastures, and the global climate. Another study develops four scenarios to illustrate the fact that a reduction of the number of people suffering food insecurity by 2015 and beyond can only be achieved if investments in rural development, health, education and agricultural research are increased. falling water tables and rising temperatures. Lester R. Brown. 2015 and 2050. J. von Braun et al. 2020 Discussion Paper No 39.
International Food Policy Research Institute. Washington. 2005. 32 p.
Many industrialised countries are supporting their agricultural exports with massive subsidies, while developing countries are pressured into continually reducing their import tariffs on farm products. The resulting flow of cheap food to developing countries, although welcomed by urban consumers, leads to the ruin of rural farmers. With a view to the upcoming WTO Ministerial Conference planned to take place in December in Hong Kong, Oxfam demands that industrialised countries cancel all export subsidies. At the same time, developing countries should be allowed more flexibility, enabling them to tailor their agricultural trade policies to the needs of rural development and poverty reduction. In concrete terms, they should be allowed to reduce their tariffs more conservatively, and, with regard to certain products that are vital to food security, not to reduce them at all. In fact, specific mechanisms should enable them to react to sudden fluctuations in quantities and prices, as well as to subsidised exports from industrialised countries, by actually raising the tariffs. Furthermore, Oxfam demands that the regulation of international agricultural trade remain fully in the hands of the WTO. Oxfam explicitly rejects regional trade agreements, as well as IMF and World Bank payments tied to trade policy conditions. Finally, Oxfam calls on the developing countries to raise their investments into sustainable agriculture. farmers in poor countries. Oxfam Briefing Paper 72. April 2005. 69 p.
The issue of phased certification was discussed at a workshop of the International Tropical Timber Organization (ITTO) held recently in Berne, Switzerland, as a means of addressing the problem of tropical developing countries lagging behind with timber certification. Phased approaches facilitate access to forestry product markets before the certification process is fully completed. In January 2002, 109 million ha of forests were certified worldwide. Only 8% of this area is located in developing countries. On the whole, less than 3% of the world’s forest area is currently certified, meaning that the impact of certification on forests is low, if not insignificant. Workshop participants were mainly concerned with two issues, the first being the promotion of tropical forest certification in view of the current market variability, as well as stakeholder requirements related to legality and sustainability, and the second being the implementation of phased approaches to certification. solve the question of sustainable forest management. The link to governance issues in the forestry sector is evident (illegal logging), and international support will be needed. In this respect, the Swiss government could take on an important part in promoting policy dialogue on forestry issues. The Centre for Development and Environment, in collaboration with partners from Switzerland and from the South, has developed a new tool for promoting local innovations. The tool consists of a moderated workshop that supports a social learning process involving representatives of rural communities, NGOs, technicians, and political communities. The process focuses on interactive identification and validation of local innovations, as well as the development of a plan for concerted promotion of the most promising innovations. Technical and, in particular, social and institutional local innovations are essential for sustainable rural development. 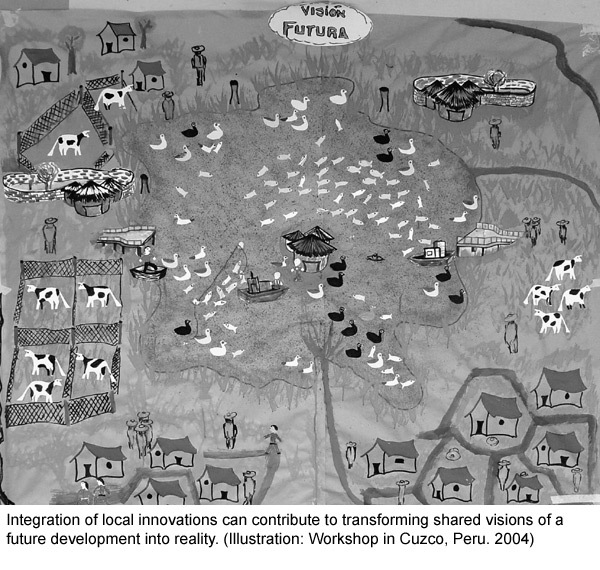 The innovative power of rural communities becomes particularly important in contexts of constantly changing social, economic, political and ecological conditions. 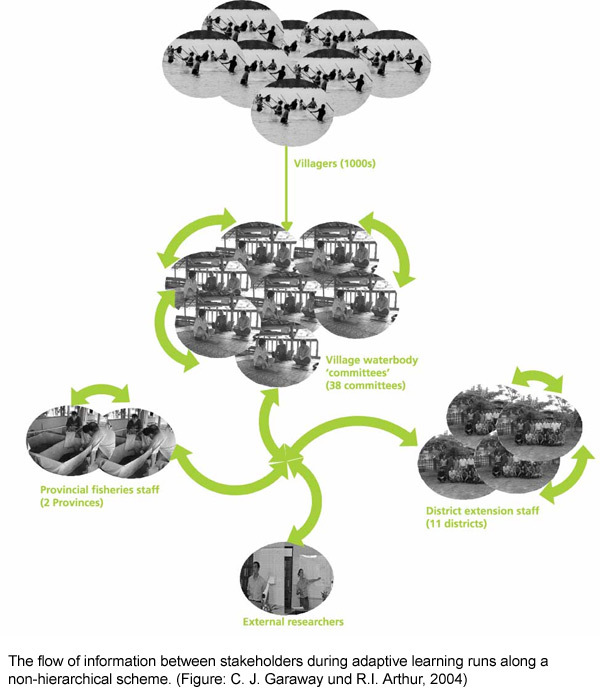 This new tool can help to integrate endogenous potentials more systematically into planning and implementation of programmes and projects. By doing so, it helps prevent a one-sided focus on external, mostly technical innovations from competing with locally rooted innovation potentials. 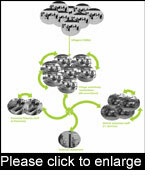 The tool’s six work units are explained based on experiences from two five-day workshops in Peru. 75% of the genetic diversity in agricultural plants existing in 1900 has been lost. This is particularly due to the abandonment of highly diverse local varieties and cultures and their replacement with genetically uniform high-yield varieties. Today, agrobiodiversity is additionally threatened by the globalisation of food systems, HIV/AIDS, and the increasing feminisation of agriculture. Loss of agrobiodiversity also means a loss of food security. The use and cultivation of agrobiodiversity are closely linked with rural populations’ varied livelihood strategies based on local knowledge and a gender-specific division of tasks. A new manual shows ways of integrating these interlinkages into international policies, agreements, and projects. Fact sheets provide thorough explanations of the complex interrelations between agrobiodiversity, local knowledge, and gender-specific aspects. Process sheets then suggest ways of exploring these interrelations during shared learning processes with the affected population in a local context. 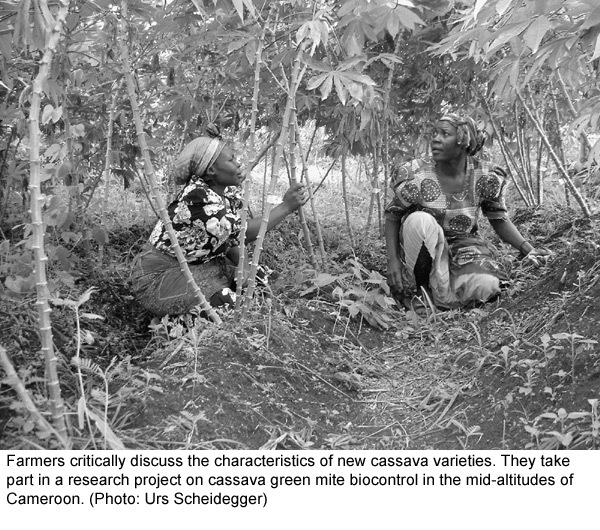 Source: Building on Gender, Agrobiodiversity and Local Knowledge: A Training Manual. Links, FAO. 2005. 88p. The Laotian government encouraged the stocking of small water bodies with hatchery produced fish in order to increase fishery production. However, experiments showed that the expected results with regard to production increase, distribution and institutional sustainability have not materialised. Natural resource use is often based on incomplete knowledge of both ecological and institutional interrelations. The adaptive learning approach does not attempt to hide these uncertainties, but rather tries to reduce them in a shared process involving the various stakeholders, while at the same time enabling decisions concerning resource use. Learning and resource use take place simultaneously. In this process, information sharing and communication are of vital importance. The guidelines offer practice-oriented advice on how to implement adaptive learning in three steps: preparing, learning, and evaluating. Among other things, the guidelines explain under which circumstances adaptive learning makes sense, which skills and resources are needed to implement it, and what kind of problems may be encountered during the process. The guidelines were developed and tested in a fishery context in Laos. Ltd London. 2004. 44 p.
What are the challenges of natural resource management for least developed countries (LDCs)? The publication ”Lands of the Poor”, part of the United Nations Capital Development Fund mandate to reduce poverty in LDCs, centres on an analysis of current thinking and debate on environmental issues and on the Millennium Development Goals (MDGs). Its aim is to establish a policy framework and pinpoint appropriate strategic options. Both the social fabric and safety of poor populations are compromised by the collapse of ecosystems. For local governments, productive resources represent a source of legitimacy and economic potential. Consequently, environmental protection and efforts to reinforce local democracy overlap, sometimes resulting in conflict. Local development programmes were involved in recent projects. Past experience shows that, if this challenge is to be tackled successfully, greater focus must be given to environmental governance, its planning, its institutional, administrative and financial framework, as well as the place of civil society in the process. Finally, the author offers a rare but welcome critically argued look at LDCs and their place in an environmental protection context, and proposes a way to consider them at the local level. Nations Capital Development Fund (UNCDF), 2004. 162 p.
exploitation, forest extraction, drug trafficking). Forests can also be the subject of a number of disputes on the exploitation of ever decreasing forest resources between local populations, each fighting for their own survival. A recent publication by the European Tropical Forest Research Network (ETFRN) provides an update on the issue of ”forests and conflicts”. They offer a range of case studies, examples of which include how to protect nature in a war zone, the implications for forest management and the local populations in the Congo, the roles of institutions in Mozambique, the peace process in Colombia and the co-management of forests in Ethiopia and in Nepal. The report also presents a toolkit, which is aimed at closely linking conflict management with development cooperation. Based on lessons already learned, it proposes examples of key projects, a survey on the identification of conflict sensitivities, and provides a list of relevant organisations and specialists in the field. Source: Forests and conflicts. European Tropical Forest Research Network (ETFRN). News no. 43 – 44, Winter 2004 – 2005. 140 p.
At a conference of the European Forum on Agricultural Research for Development (EFARD) in Zurich, Switzerland, participants drew up a new agenda for a European contribution to agricultural research for development. They also adopted a so-called ”Zurich Declaration”. EFARD regards itself as part of the Global Forum on Agricultural Research and supports a holistic research approach that integrates aspects of human health, sustainability, knowledge transfer, and education. The members of the Forum intend to contribute directly to Millennium Development Goals 1 (eradication of extreme poverty and hunger) and 7 (ensuring of environmental sustainability), as well as indirectly to the remaining MDGs. EFARD plans to strengthen the involvement of the new EU member states, and to promote collaboration in partnerships between South and North, South and South, as well as with the research centres of the Consultative Group on International Agricultural Research (CGIAR). In Europe, EFARD wants to increase active exchange with other similar initiatives. The Forum calls on the European Commission and the governments of the EFARD member states to support agricultural research and thereby contribute to making a significant step towards the Millennium Development Goals. for Development: European Responses to Changing Global Needs, 27 – 29 April 2005, Swiss Federal Institute of Technology Zurich, Switzerland. Issues Paper, including Zurich Declaration. 15p.